Version 6.18 introduces Player Stats in the Android app! Previously, fans with premium subscriptions could only access player stats via the website or the iOS app. Now Android users have everything in one place. 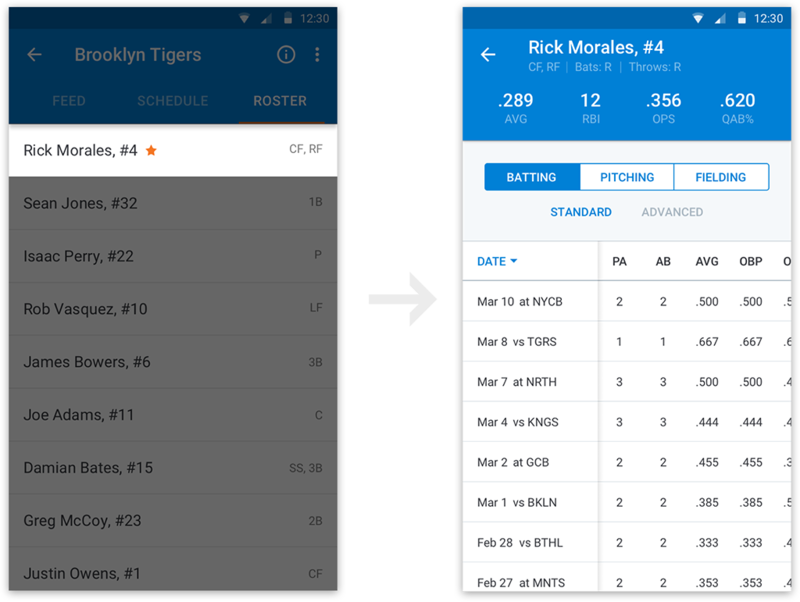 This popular feature allows fans to stay connected to their favorite players all season long. Player stats are available for Premium subscribers. To view a certain player’s stats, all a fan has to do is tap on the roster icon, and then select their player of choice. Please note, admins still have control over privacy settings for their teams. Therefore, in some cases, an admin might not allow any fans access to individual or season stats and in other cases, a Premium fan might have to request membership from the admin before being granted access to stats. Find more information on how to request membership here. 1. Directly through the player stats paywall.